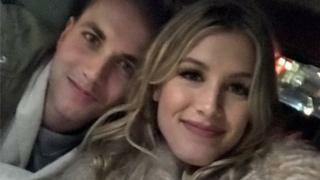 A few months ago, Canadian tennis star Eugenie Bouchard agreed to a date after losing a Super Bowl wager to New England Patriots fan John Goehrke. It seemed like a fun one-off event, even as Ms Bouchard declared Mr Goehrke a "gentleman" and granted him a second date. But the tennis star and University of Missouri student have apparently kept in touch. On Thursday, Ms Bouchard tweeted photos of the pair reuniting. "‪Look who came to visit me!" Ms Bouchard, 23, wrote on Twitter, with a photo of the pair reclining on a sofa. The saga behind the original date has charmed millions as it played out online, starting amid the drama of the 2017 Super Bowl. On Twitter, Ms Bouchard was predicting the victory of the Atlanta Falcons who, at the time, were 21-0 ahead of the Patriots. Then New England fan Mr Goehrke bet her a date that his team would emerge victorious. She accepted the challenge. The Patriots mounted a historic, nail-biting comeback in overtime. The 2014 Wimbledon finalist followed through and met the University of Missouri student in New York that month to watch a basketball game. "Just met my 'Super Bowl Twitter Date' John. On our way to the @BrooklynNets game!" she wrote.